So before I start, some full disclosure: We are far more along on our project than what I am posting now. In fact, most of these pictures are from exactly 1 year ago today. Makes it very interesting to take a look back and see how much progress we’ve made, and just how much can be done in a year’s time. 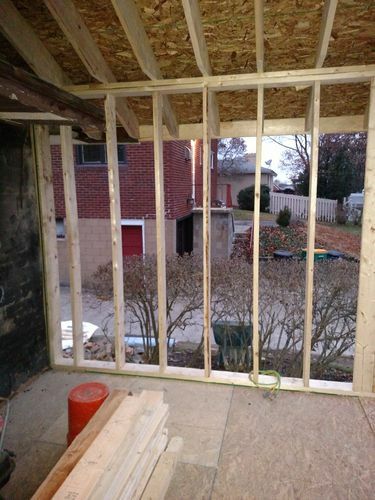 The first step (no pun intended) was to frame in the new floor so we could have access to our back door again. 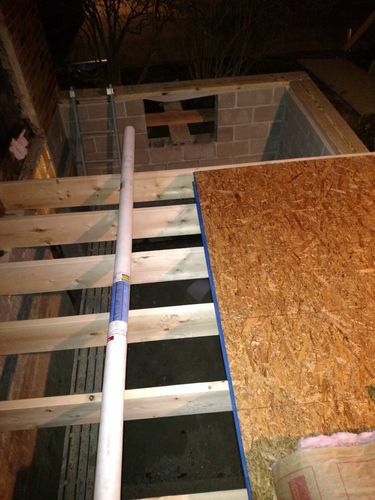 Then the plywood went down over top of the floor joists and the framing for the wall began. All of the original structure remained standing, including the old walls and roof. 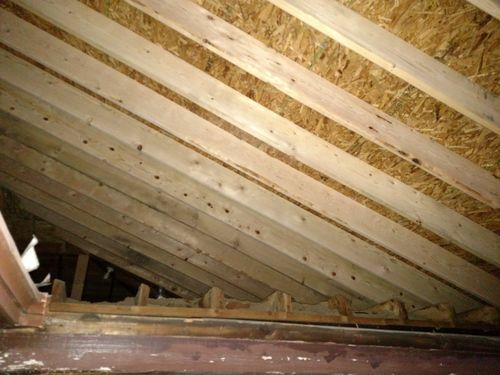 The new walls and roof went up completely around it, and I got my first glimpse at my new attic storage space. 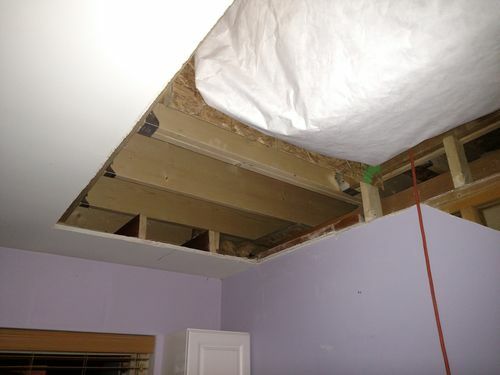 I had to go up there to remove the old insulation, and it was pretty spacious. 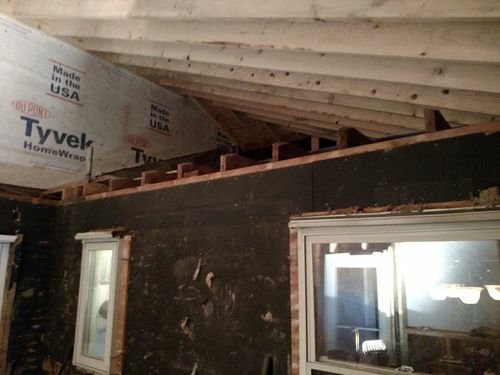 I’m actually able to stand up against the new 2nd floor wall, which will be nice. Once everything was closed in, we began using the back door to move supplies in and out. Although Bo was happy to us the back door, he was a little confused as to what was actually going on. 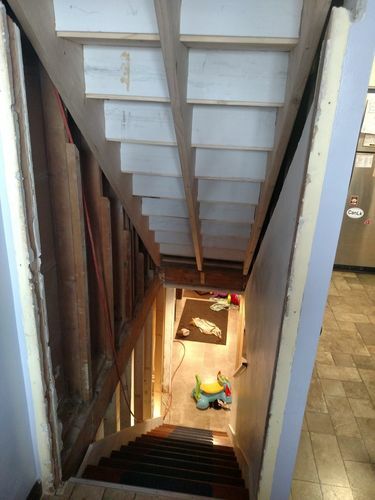 Now that everything was closed in on the outside, it was time to start cutting in the steps to the second floor, which meant much more Demo. 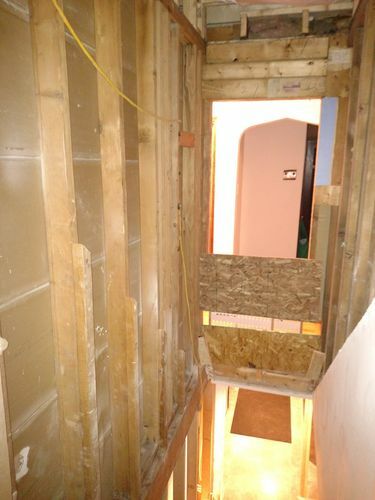 Because the stairs will be stacked on top of each other, we had to cut out the walls and ceiling about the existing steps. Heres the view from the other side. We put up a temporary barricade to prevent the kids or dog from a bad fall. 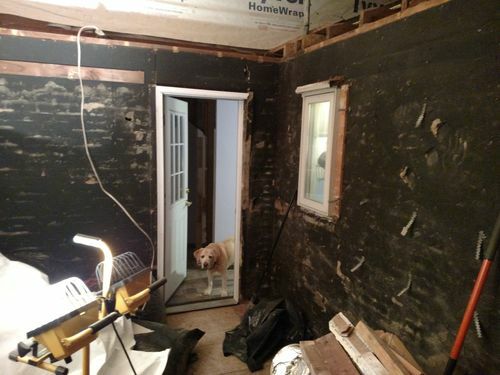 Even the ceiling in the mud room had to go. 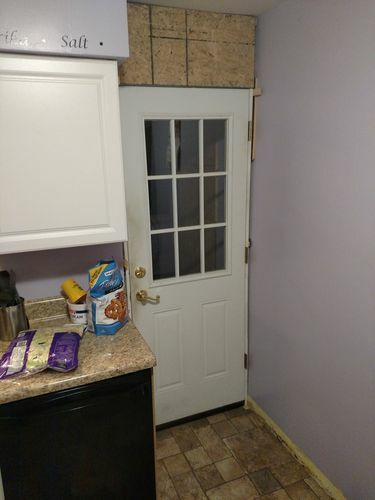 Because this opened up the house and the new rooms were un=insulated, we move the old back door to block off where the old mudroom was. Our house is supposed to be getting bigger, but its officially shrinking. 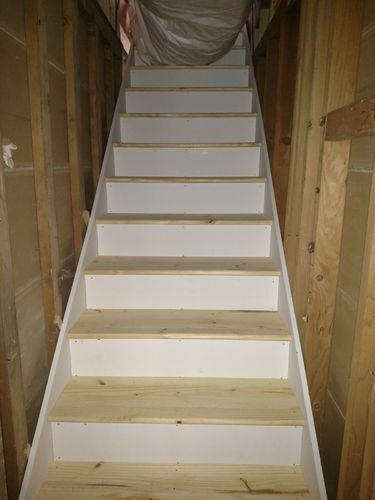 After a few days, the stairs were finally in. Most Importantly, my daughter Meadow was very concerned about Santa Claus being able to navigate with all of the construction. I tried to reassure her that he would figure out, but she wasn’t convinced. So I made this sign at school and posted it up in our front yard. Not only did it help convey some important information, but it also helped to ease my 6 yr. old daughter’s curiosity. And with that, we were pretty much closed in. 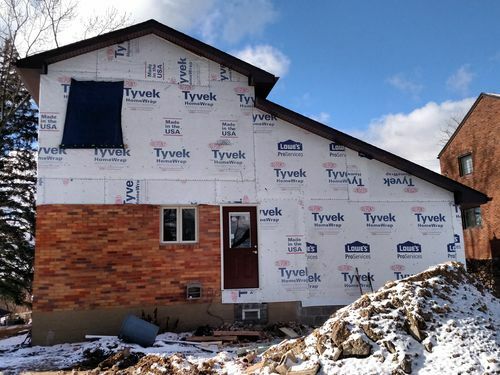 here’s a good look at the big picture from the outside, all new construction is wrapped. Well i think thats enough for one post, I’ll try to get back to the next steps soon. 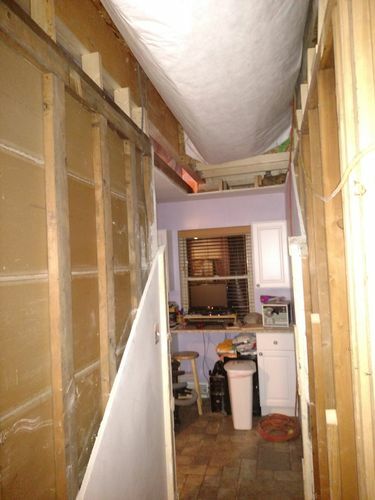 Up next, you guessed it, more Demolition! 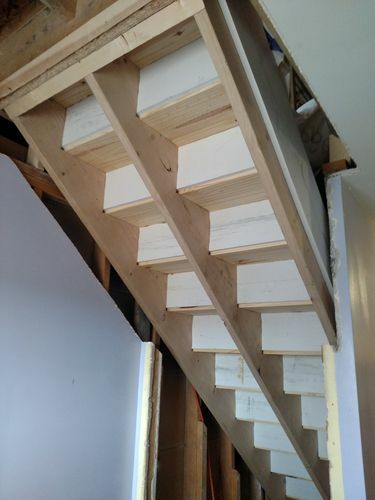 The progress is looking up. I kind of remember those days but don’t want to think of them anymore. Keep up the good work, it’s interesting. Great picture of the girls standing out in front. It will make more memories as they get older. That is some good progress so far. 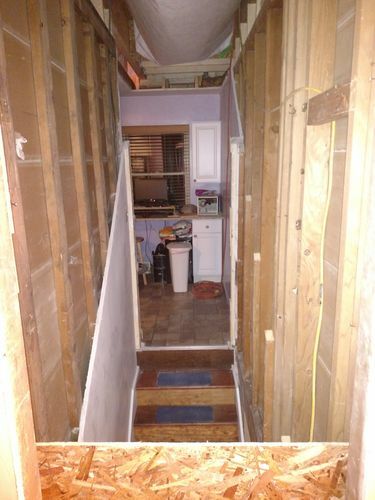 You will sure enjoy all the extra indoor space!! 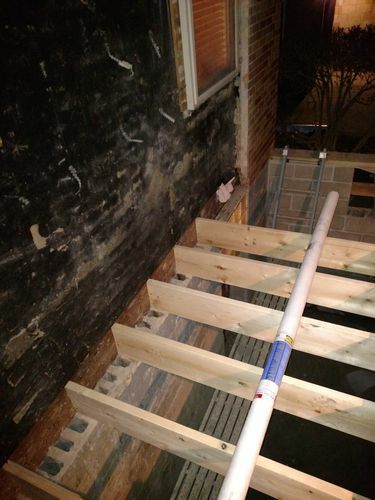 Looking good Tooch, glad to see its all progressing well and you have been busy with building works as well as pens. Nice get out of jail job with the Santa sign !! Brings back some good, and a lot of not so good memories, last 3 houses, 2 we had built, a lot more real bad memories! Think there may be one more in the future? Tooch, that is a lot of work. Looks like you are doing a nice neat job on all the new structures. The sign is a nice touch. Your daughter will long remember it. Hope you took a picture of her next to the sign. Eager to see the newest installment when you get a chance to post it. This is a job for a young man who knows no fear and a patient wife. I envy you. 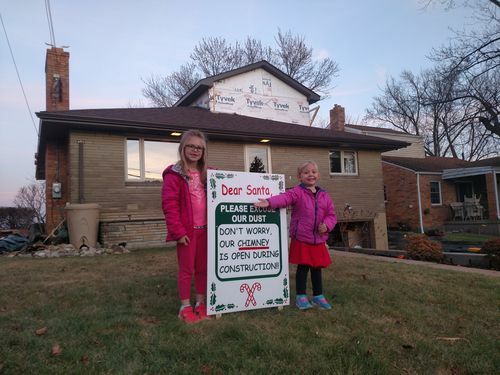 oh yeah brings back memories of my addition and remodel,dont miss it or the wife complaining how long its took-lol.love the sign for santa,your kids are darling.